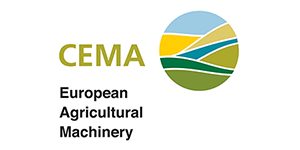 CEMA is the association representing the European agricultural machinery industry. With 10 national member associations, the CEMA network represents both large multinational companies as well as the numerous European SMEs active in this sector. CEMA includes more than 4,500 manufacturers, generating an aggregated annual turnover of more than EUR 26 billion. 135,000 people are directly employed in the sector, with a further 125,000 people working in distribution and maintenance. • promotes a deeper understanding of the European agricultural machinery industry among EU decision makers, regulators and stakeholders. Precision Farming and the adoption of smart Farming tools have been firmly placed as a priority on CEMA’s agenda for the coming years. It tries to promote uptake off smart farming not only politically, but also with practical demos. CEMA has been very active in introducing the environmental requirements for sprayers inside the Machinery directive with 2009/127/EC as part the holistic approach in the Sustainable Use Directive. CEMA has a dedicated project team ‘sprayers’ that consist of experts from companies and associations from all over Europe. Discussions relate to sprayer standards and legislation but also PPP authorisation and the mitigation ways and the practice and gaps in the applications and practice. E.g. CEMA is active in introducing the necessary rules for Closed Transfer Systems and better understanding of drift mitigation tests and practice through participation in the relevant groups. Over the last years, CEMA has been closely collaborating with ECPA to develop an easy to use online tool STEP-water (Sprayer Technologies for the Protection of WATER). This free on-line Sprayer Technology for Water Protection decision support tool quickly and easily takes operators through the range of sprayer equipment options, from the simplest to the most comprehensive solutions, with a focus on the technical optimization of the existing spray equipment as well as on the legal and environmental considerations while purchasing new equipment.